Ultra-Absorbent Christmas Tree Mat by Bungalow at Two Clock. MPN: 20293593535. Hurry! Limited time offer. Offer valid only while supplies last. Ultra-Absorbent Christmas Tree Mat. Getting a real tree this year? Protect your floors from damage with this incredibly tough and absorbent tree mat. Ultra-Absorbent Christmas Tree Mat. Getting a real tree this year? Protect your floors from damage with this incredibly tough and absorbent tree mat. The raised surface of the mat has grooves that trap water and debris on the mat, keeping your floors clean and dry. Plus, the high absorbency material holds up to a gallon of water per square yard! The ultimate Christmas tree mat, whether you have wood floors or carpet. More than just a pretty decoration, this mat is flame-resistant, and also resists fading, rot, mold and mildew. Easy to clean at the end of the season--just hose down and air dry. Anti-slip rubber backing. 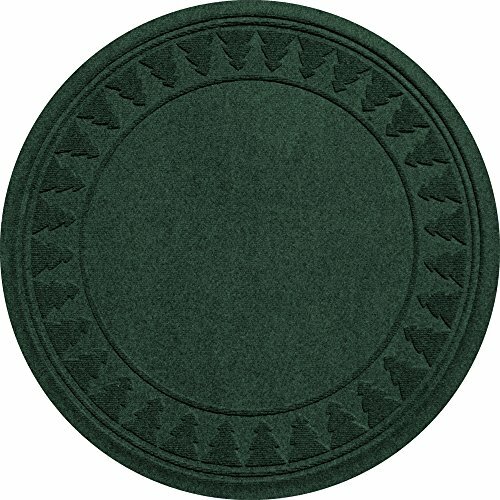 34.75" diameter, with a classic tree motif border. Red or Green. Protect your floors and enjoy your real Christmas tree worry-free, with this high-absorbency tree mat. Order yours from Brookstone now! Please note: all dimensions are approximate. Some rugs vary slightly depending on pattern. If you have any questions about this product by Bungalow, contact us by completing and submitting the form below. If you are looking for a specif part number, please include it with your message. Christmas Tree Stand Mat Absorbent Water Trapper for Floor Protection Best Under Xmas Tree Carpet Mat. This 32" Round Christmas Tree Floor Protecting Mat Hogs Water. One of the Best Water Trapper Mats.